From apples to zucchini, fresh, attractive, and tasty organically grown produce is bursting forth from supermarkets across the United States. Americans are choosing appealing organic items from other sections of their supermarkets, too, including organic meats, breads, prepared convenience items, and dairy products—even baby foods. In fact, retail sales of increasingly affordable organic products reached $7.8 billion in the United States in the year 2000. Today, one out of every four Americans buys organic products. From coast to coast, Agricultural Research Service scientists are bringing their expertise and advanced technologies to bear in helping organic farmers tackle their toughest problems. Some of their studies are being conducted on ARS-managed research sites that are certified as organic farms. Other experiments are under way on working organic farms ranging from small family operations to large, corporate acreage. For a farm to be certified as organic, every one of its products must be grown in accordance with organic standards. 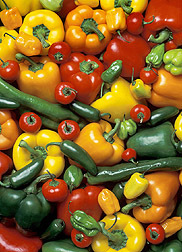 The findings from these ARS studies help organic and conventional farmers alike. Along California's central coast, Eric B. Brennan is targeting organic farmers' single biggest expense—weeds. He is a horticulturist at ARS' Crop Protection and Improvement Unit in the Salinas Valley, the "Salad Bowl of America." 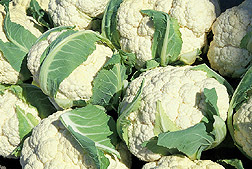 Many conventional and organic growers of broccoli, lettuce, and sweet peppers regularly plant so-called cover crops in their fields after they have harvested their cash crops. Instead of being cut and sold, the cover crops are plowed under to nourish the soil. But weeds make inroads into these cover crop plantings, says Brennan, and the weed seeds infest the soil for next year's cash crop. In a new study, Brennan is comparing two different patterns of planting the seeds of cover crops to see which results in fewer weed seeds. One is the traditional pattern of planting in which the tractor-drawn seeder is driven back and forth along the field, up and down every row. The other seeding pattern is crisscross, or crosshatch, where planting rows intersect. "Shifting the geometry of the pattern from the traditional to the crosshatch may make a significant difference to the grower," says Brennan. "That's because the crosshatch pattern changes the orientation of one plant to another. 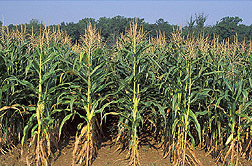 This results in more even distribution of the cover crop plants and fewer gaps where weeds may grow and produce seed. The cover crop plants might then shade more of the soil surface earlier in the season so that the weeds won't produce as many seeds. However, crisscrossing the field for planting takes more tractor fuel because the field must be covered twice instead of just once, and it may increase soil compaction. "Even a slight reduction in weed control costs is important. That's because the organic farmer today may have to spend up to $1,000 an acre to clobber weeds," Brennan explains. "Conventional farmers spend only about $50 an acre on the herbicides that knock out every weed in sight. 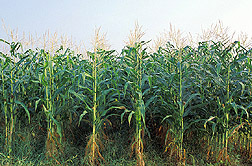 Organic farmers, of course, can't use conventional herbicides," he adds. Brennan conducted the study on both USDA's certified organic field down the road from his lab and on a soon-to-be-certified organic field of Takamura & Antle, one of the nation's largest growers of organic lettuce. For the cover crops in the study, Brennan, along with Mark Mason, T & A's pest control advisor, and Richard Smith, a local University of California Cooperative Extension agent, decided to plant Merced rye and Sudan grass. For each pattern, they used equal amounts of each cover crop seed on each of the plots. They are sampling the sites for seeds of hairy nightshade, shepherd's purse, burning nettles, and other common weeds. In this year's followup study, they will look at the economics of the two planting patterns. And they will use a quantum light sensor to compare more precisely the amount of ground shade created by the cover plants growing in the two patterns. Brennan thinks that this study will be the first to specifically compare the two seeding patterns in organically grown cover crops. Baby salad mixes—the popular blends of crisp, bite-sized salad greens—are the focus of another of Brennan's studies. These assortments of easy-to-use greens include small, colorful favorites like romaine and green leaf lettuce and radicchio. The individual greens that make up these fun medleys are mechanically harvested. They are clipped off at the surface of the field, washed at a packinghouse, quickly sorted into pleasing assemblies, and then shipped to grocers for sale in loose bins or in small, branded retail packages. Unfortunately, a vigorous cover crop can pose problems later on when the baby greens are harvested. As Brennan points out, "Most of the cover crop is plowed under at the end of its season, but that practice may leave behind some stems on the surface. And the plowing-under process itself brings up roots. If that residue hasn't decomposed by the end of the next growing season, the harvester can pick up the cover crop residue along with the baby greens. The problem is that the residue is proportionately larger than the small greens. You don't have that problem when harvesting full-sized greens because they are hand picked, and the residue is proportionately smaller." One solution to this unique problem might be to aim for a somewhat smaller cover crop plant that would decompose more rapidly. A way to get smaller cover crop plants, Brennan says, is to plant more seeds per acre, thereby encouraging competition between the plants. So in this experiment, he is doubling the recommended seeding rate of several cover crops, such as oats and rye. Brennan expects preliminary results of this study by May 2002. Crunchy apples and creamy-white pears from the orchards of the Pacific Northwest are eagerly sought by food buyers here and abroad. But some foreign food buyers require growers and packers to take special steps to ensure that the fruit exported from the United States is free of certain pests. In South Korea, Japan, Taiwan, Canada, and Mexico, the concern focuses on codling moth and oriental fruit moth. The light-pink worm, or larva, of the codling moth, Cydia pomonella, and the white worm of the oriental fruit moth, Grapholitha molesta, hungrily feed on fruit. ARS entomologist Lisa G. Neven is providing practical, affordable techniques to packers to disinfest these premium fruits. Her approach is suitable for use by both organic and conventional growers. Neven is based at the ARS Fruit and Vegetable Insect Research Unit in Wapato, Washington. She is doing these experiments with PacOrganic and King Blossom, two organic producer-packers in Washington state. (K9802-1) Neven's method relies on placing bins of fruit in chambers and then changing the temperature and composition of the atmosphere surrounding them for a period of time. Her tests with apples showed that raising the temperature of the atmosphere about 18°F an hour until the fruit's internal temperature is 111°F to 117°F, in a mix of 1 percent oxygen and 15 percent carbon dioxide, zaps any living codling moths or oriental fruit moths. She did these tests on more than 138,000 pounds of Gala, Jonagold, Braeburn, Granny Smith, Fuji, and Golden and Red Delicious apples. "We've shown that this regimen helps maintain apples' quality longer," says Neven. "And people tell us they can't detect any difference between treated and untreated apples." Organic growers aren't the only ones interested in Neven's work. Conventional growers who today fumigate their fruit for export with methyl bromide are following her studies because of the escalating cost of the chemical. Says Neven, "In the past, methyl bromide cost about $5 per 100 pounds. Today it costs about $660 per 100 pounds. And it's expected to go still higher," before it is phased out in a few years. Neven calls her procedure CATTS, short for Controlled Atmosphere Temperature Treatment System. 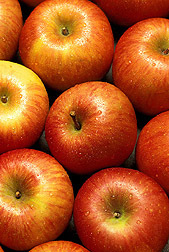 The approach on apples and pears is based in part on work done earlier by scientists in Israel. In tests of California Bartlett pears, Neven is working with Elizabeth Mitcham of the University of California at Davis. Neven's newest collaboration is with ARS plant physiologist David M. Obenland at Parlier, California. Their work, now in its second year, targets nectarines, peaches, and apricots. Initial results are very encouraging, Neven says. "CATTS-treated nectarines are juicier than untreated fruits." Beneficial soil microbes help plants get the nutrients they need to flourish. Now ARS studies may show that soil microbes are helped both by organic fertilizers and conservation tillage—long-standing practices of organic farms and some conventional farms. All-natural, organic fertilizers are those approved for producing certified organic crops. Larry M. Zibilske, a soil scientist in the Integrated Farming and Natural Resources Research Unit at Weslaco, Texas, and Joe M. Bradford, head of the unit, are examining how organic fertilizers help soil microbes do the job of increasing the uptake of nutrients by plants. They are working with specialists from three companies that produce organic-based fertilizers: Earthwise Organics, Inc., of Harlingen, Texas; Ag Organics, Inc., of Houston, Texas; and Gardenville Fertilizer Corp., of San Antonio, Texas. These specialized fertilizers include compost and processed animal manure pellets. The studies of these products are taking place in greenhouses, using strawberries as a model plant. "We are impressed with the high levels of nutrients in the organic fertilizers and the rates at which the nutrients are released into the soil," says Zibilske. "We don't know yet exactly how the microbes free up or release the nutrients. But the microbes seem to release the nutrients at the time when the developing strawberry plant needs them most." In other experiments, Zibilske and Bradford have successfully used conservation tillage to boost the enzymatic zeal of microbes, which helps plants take more nutrients from the soil. Unlike traditional tillage, conservation tillage requires leaving the crop residue on the field surface after harvest. This plant material provides several benefits while it slowly decays. "We've improved the uptake of phosphorus, iron, and other nutrients in both corn and cotton," Zibilske says. Bradford notes further, "Our studies have shown that leaving crop residue decreases wind and water erosion, prevents water loss through evaporation, and doesn't hurt crop growth or yield in subtropical environments like southern Texas. And, of course, by not plowing under the crop residue, the farmers save on costs of labor, fuel, and tractors and other equipment." Organically grown soybeans intended for the tofu market won't pass muster if they're stained. In 1998, only 5 percent of Iowa's large-seeded, high-protein, organic soybean crop was rejected for the purpose of making silky tofu because of unsightly purple stains. But in 1999, rejection rates increased dramatically to about 50 percent. Douglas L. Karlen and his colleagues at Ames, Iowa, are intent on solving the problem of soybean staining. Part of the Agricultural Land Management Research Unit, they are working with scientists at Iowa State University and with the Heartland Organic Cooperative, a group of organic farmers in the state. Normally, blemish-free soybeans command premium prices in Japan for making silky tofu. Unlike firm tofu, which is used for cooking stir-fry dishes, for example, silky tofu has a soft, custardlike consistency and is eaten raw or used in soups and desserts. Both forms of tofu are made from soybeans that have been soaked, then ground and cooked. The cooked soymilk is formed into bean curd, much like making cottage cheese from milk. In this past year, conventionally produced soybeans sold for about $4.55 per bushel, whereas the large-seeded, high-protein, organic soybeans sold for about $14.50. That's lower, however, than the $19 per bushel that this type of organic soybean has sold for in the past. Recent analysis by Karlen and his associates pinpointed the soybean leaf beetle as the culprit. This pest transmits the bean pod mottle virus to healthy plants. Notes Karlen, "Because of warmer-than-average winter temperatures in 1997, 1998, and 1999—especially in the southwestern area of the state—the overwintering beetle population increased rapidly. The resulting beetle population, first and second generations, created much greater insect pressure during the subsequent growing season, causing the unusual increase in soybean staining. "We found that there were lower beetle populations and little-to-moderate staining of soybeans in the northeastern portion of the state where winter temperatures were colder." In a series of experiments, Karlen and his co-workers are testing nine all-natural compounds to boost plant vigor or otherwise help combat the insect or the virus. These include applications of molasses to increase plant sugars and thus insect resistance, baking soda to kill pathogenic microbes, garlic for insect control, and organic compost to minimize plant stress. The compost was applied to the soil before planting, while the other treatments were applied directly to the plants every 2 weeks from July to mid-September. The researchers are also examining botanically based Neem and rotenone to control insects naturally, hydrogen peroxide to control microorganisms, and humic and fulvic acids to stimulate plant vigor and counteract plant diseases. Preliminary findings suggest that rotenone or the humic and fulvic acid treatments can slightly reduce staining. Karlen's team expects to finish analyzing further results this year. They are doing much of the work on five organic farms across Iowa. Nick Maravell's 165-acre organic farm is nestled in a valley near the charming village of Buckeystown, Maryland. He grows organic hay, edible soybeans, corn, barley, rye, and hairy vetch. He also has a small herd of Angus cattle he is raising for beef. Maravell runs the largest operation of the several farmers working with ARS researchers John R. Teasdale, Michel A. Cavigelli, and Mark G. Davis. 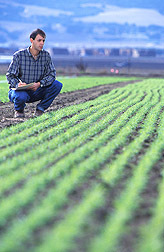 The scientists are based at the Sustainable Agricultural Systems Laboratory in Beltsville, Maryland. Their work involves comparing several organic farming systems to conventional methods. For instance, Cavigelli and co-workers are looking at the effects of cover crops on weeds, erosion, and nitrogen. Everything on Maravell's farm is organic. "We don't use any commercial fertilizers, herbicides, insecticides, parasiticides, antibiotics, or growth hormones. Everything our cows eat all the time is organically grown—whether they are grazing on grass or eating baled hay," Maravell says. "There are state and new national regulations on what it takes to produce organic meat. Cattle that are grown for beef must be raised organically their entire lives. But cattle that are grown for breeding can be raised conventionally until the last third of each pregnancy. At that point the rules kick in, and the cow cannot be given any antibiotics, growth hormones, or parasite medicines. But we don't use any of these treatments at any time—even though we legally could," he says. Maravell has begun working with another ARS researcher, Louis C. Gasbarre, a microbiologist in the Immunology and Disease Resistance Laboratory in Beltsville. Gasbarre is developing methods to identify those cattle genetically prone to higher-than-usual parasite infestations. Gasbarre's work will help farmers to convert their herds from "all-natural" to "organic." All-natural herds can receive parasiticides, but organic cattle cannot. Both kinds of herds are fed only organic grass and other organic feeds. Gasbarre is identifying the species of parasites in each herd, deciphering how they are being transmitted, and determining which animals have the most. He has discovered that a few individual cows have most of the parasites in cattle herds, and this trait is strongly influenced by the animals' genes. "This means," says Gasbarre, "that growers can reduce their use of parasiticides by removing or treating the few high-parasite animals once they're identified." The farmer would either cull the vulnerable calves or, if they are valuable for other reasons, treat them for parasites and then sell the meat in the nonorganic market. In addition, Gasbarre is using the susceptible animals to find the genes and gene markers for parasite susceptibility. Gene markers are pieces of genetic material that are inherited with the trait of interest. The gene markers can be used to develop rapid and inexpensive tests for vulnerability to parasites. "Our goal," says Gasbarre, "is to minimize use of parasiticides and keep production levels as high as possible. "—By Marcia Wood, Lupe Chavez, and Don Comis, Agricultural Research Service Information Staff. ; and Jennifer Arnold, formerly with ARS. 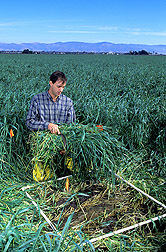 This research is part of Soil Resource Management (#202) and Integrated Agricultural Systems (#207), two ARS National Programs described on the World Wide Web at http://www.nps.ars.usda.gov. 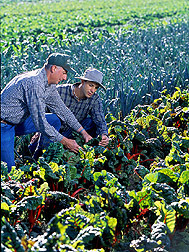 Read more about organic farming by contacting the web site of the ARS National Agricultural Library's Alternative Farming Systems Information Center at http://www.nal.usda.gov/afsic. To reach scientists mentioned in this article, contact Marcia Wood, USDA-ARS Information Staff, 5601 Sunnyside Ave., Beltsville, MD 20705-5129; phone (301) 504-1662, fax (301) 504-1641. "Organic Grows on America!" was published in the February 2002 issue of Agricultural Research magazine.